Two Finnish women in their 20s writing about DIY-projects, fashion,food, beauty and everyday life. New week, new nails. A very simple design made fast with a black and a white nail art pen. I could have maybe done the stripes better, but I've been a bit sick and my hands are very shaky :) I used Sally Hansen's Diamond Strength nail hardener as a base, as always. I sealed the nails with Mavala's Top coat fixator. Smoothiet on ehkä yksi helpoimmista tavoista lisätä vihannesten ja hedelmien kulutusta. Ihmisen pitäisi syödä hedelmiä sekä vihanneksia vähintään puoli kiloa päivässä. Se saattaa tuntua isolta määrältä, mutta kun pikkuhiljaa lisää hedelmien ja vihannesten määrää ruokavalioonsa, terveellisestä ruokavaliosta on pian vaikea luopua :) Hedelmien syöminen ei tuota yleensä vaikeuksia ihmisille, mutta vihannesten syöminen tuntuu olevan vaikeampaa. Itse noudatan sääntöä jonka mukaan syön joka aterialla ainakin yhden hedelmän tai vaihtoehtoisesti annoksen vihanneksia. Smootheihin yritän aina lisätä vihanneksia, mm. porkkanaa, avocadoa tai pinaattia. Avocado on myös oiva levite leivälle, ja sopii erinomaisesti etenkin kalkkunaleikkeen kaveriksi. Tässäpä terveellinen resepti joka sisältää sekä hedelmiä, paljon kuitua ja vähän vihannestakin. Ohjeesta tulee yksi iso lasillinen. 2. heitä kaikki ainesosat blenderiin. Seesaminsiemenet kannattaa laittaa viimeiseksi. 3. Sekoita kunnes seos on tasaista. 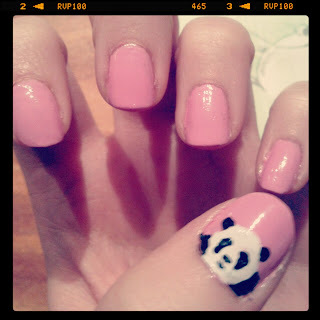 I did these cute Barbie pink panda nails a few days ago. I did the panda with white and black nailart brushes. I have an Iittala Aalto-tray with a candle and glass beads in the livingroom. I threw the smaller sea shells with the beads, and I'm really happy about the result. 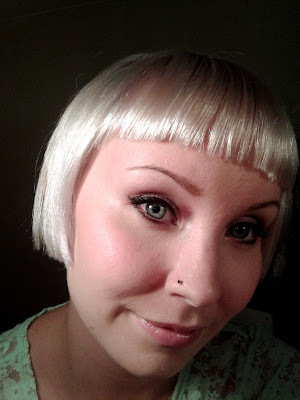 Finally I have super blonde platinum hair. And a new, "longer in the front, supershort in the back" edgy haircut as well. A while back here in my hometown Turku, a local hair salon called Avantgarde decided to organize a happening where they would give free haircuts/colouring for about 80 people. However, there was a condition: the hairstylist would have totally free hands. This wasn't a problem for me because I've had supershort hair and I've tried literally every possible colour. You can imagine that people went crazy when they heard about the happening. Why is it that when it comes to getting something for free, people freak out? Even if it got very cold, I have no regrets. The people waiting with us were super nice, and we were all making jokes and cheering each other. I got a fabulous hair colour and cut. In addition my hair was shiny and felt super soft. My colour was very blonde in the beginning so the the stylist decided she would "alter" it just a "bit". 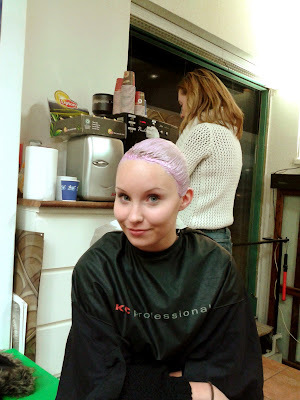 I was a bit surprised when she started putting baby pink goo in my hair :D I was actually happy when the stylist said that the colour would be "icy strawberry platinum". I love Nicki Minaj's cotton candy hair! In the end the colour doesn't really look like pink, only in a certain light. As you can see from the picture, the L'oreal pastel toning conditioner is pretty pink. In order for the colour to show properly, you HAVE TO have blonde hair. I've tested and come to the conclusion that if you want a truly light baby-pink shade of pink, it's best to mix the pastel conditioner into your normal conditioner. I use a quarter size amount of the pastel conditioner, and same amount of regular conditioner. But IF you want a pinker shade, use the toner conditioner only and leave for longer than 5 minutes. The colour will fade away in a few washs so you have to reapply pretty soon. The next picture will show you how light of a pink shade I have, you can barely call it pink. But I assure in bright daylight it looks baby-strawberry pink :) I put a white paper in front of my face for the colour to show better. I made this awesome piece of DIY wall art inspired by some creations that I found online. I finally got all my Halloween decorations put away. (Well almost all put away!) And my apartment looked so bare and sad without them. So I decided to go for a quick, easy and cheap DIY project instead. This piece I made is about 63x35cm in size; I made it to hang on the wall above my tv which is bare. However we have such high ceilings that I’ve been thinking that I will add to it once I get more toilet paper rolls. I’ve asked some friends to collect them for me as well, I know Anne has been collecting for me. First cover your work surface with lots of newspaper. Then proceed to flatten the toilet paper rolls to make them easier to cut. Be photo below. Then cut 1cm strips from the roll that look like this. I think they look like leaves or flower petals. You can either eyeball the size of the pieces like I did or for more prefect and even pieces I’d recommend using a pencil to mark lines 1cm apart. Once you have all of your toilet paper rolls cut you can start to arrange them in any pattern that you like. I wanted to keep my design in a simple trellis pattern. To do make this patter: glue 4 of your “leaves” together into a shape that looks like this. I glued one leaf at a time. Be careful not to burn your fingers if you’re using hot glue. If you are using craft glue it may be a good idea to secure your pieces together while they dry using clothes pins or even bobby pins. Once you’ ve glued all of your pieces into groups of 4 then lay out a design. I kept mine in a simple rectangle but you can get creative, just don’t start to glue until you are sure of your pattern. Once its glued together and dry remove any hot glue strings. You can hang it up as is or paint it. I wanted my wall art to look like metal so I spray painted it with silver metallic spray paint that I got form my local craft store. Always use spray paint in well ventilated areas, preferably outdoors. I spray painted mine outside but I had to bring it inside to dry as it was raining. So we kept out window opens. It took about 3 coats. After my piece was dry I added an extra bit of pizzazz with these 1 cm square mirrors that I also picked up from the craft store. I didn’t like that the glue was visible in certain areas. And when in doubt, bling it out! You could also add rhinestones, sequins or beads. If you don’t want to add anything extra then just be mindful not to over do it with the glue. Call me crazy, but this year I started christmas decorating pretty early :) I'm not usually this early, but I have a good reason; I'm leaving for Asia way before Christmas. This will be my first non-Christmassy Christmas, if you understand what I mean... I will be with my family, but we won't be having this traditional Finnish-Carelian crazy Christmas with about 15 family members. Instead, we will be celebrating Christmas with under 5 people. Don't get me wrong,I love our big traditional family Christmas, but to be honest, sometimes it has been a bit stressing. Cooking for 15 people (not alone of course) requires some work. And I think it's nice for a change to try something completely different. My miniature christmas trees. This year's theme colours for me are white,silver and gold. A candle holder I got from a charity shop for 50 cents. Two young Finnish women with international backgrounds. We both have a love for shopping, cooking, DIY projects and arts and crafts, and that's what the whole blog is about. We write in both Finnish and English.